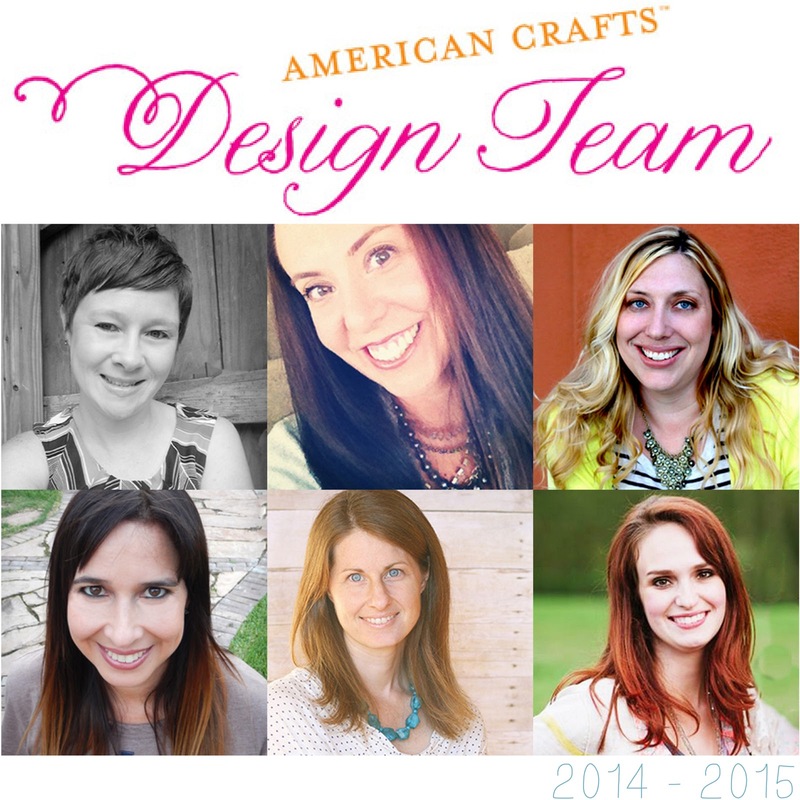 The One with the American Crafts 2014-2015 Design Team Blog Hop! Hey there! Today is the American Crafts 2014-2015 Design Team Blog Hop and I hope you'll be inspired to craft as you make your way through the 6 blogs of the design team members - we each have a fun project to share using American Crafts supplies! Description: I was inspired by the nail & string art I've seen popping up on Pinterest lately and thought I'd give it a go using baker's twine and brads with the new Shimelle line! How to: Trace a heart onto white cardstock with a pencil then mark the center top and center bottom points. Mark every 1.5" or down both sides. Pierce a brad through each pencil dot. Wrap baker's twine around the brads - I didn't have a rhyme or reason for the method to my madness, I kinda wish I did though because it's a bit of a hot mess. Oh well. Wrap the top layer color of twine around the heart to define the edge. Punch a rainbow of patterned papers into 1" circles then trim them in half. Adhere the semi circles around the heart again to define the edge. Notice I kept my brads and papers in a rainbow order for a fun look. Add a pair of photos to the right and stitch a Thickers title below. 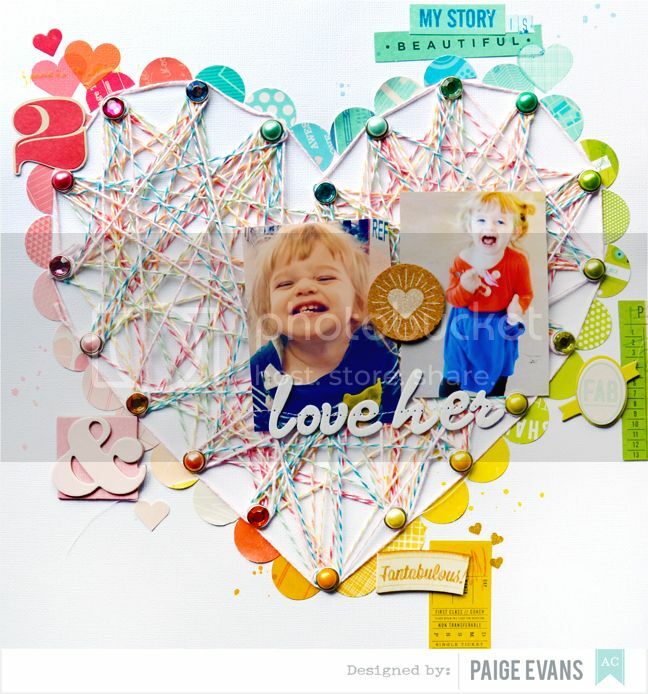 Add matching colored embellishments (such as die cuts, rub ons, wood veneer, layered chipboard, stickers, and more) around the rainbow heart then drop spray mist around the layout to finish. What's a hop without a giveaway??? Leave a comment on this post by Saturday September 6th 2014 and tell me WHAT IS YOUR FAVORITE AMERICAN CRAFTS PRODUCT? I'll randomly select a winner to receive these fun brand new, never used, never opened (well, except the #summer die cuts are loose!) American Crafts goodies! I'll update this post with the winner so be sure to check back on Saturday. Here is the full hop list in case you get a little lost, or want to open up every blog in a new window right now. Make sure you go through the entire hop, leave a comment on each blog, then visit the American Crafts blog to win a fantastic prize! Next on the hop is Ashley Horton! Have a wonderful and fun-filled day! With love, from the 2014-2015 American Crafts Design Team! Congrats Jess! Thanks for your sweet comment! Email me at paigetaylorevans at gmail dot com with your address and your prize will go out next week! Oh My Word!!!!! Love your layouts and style, but this one is over the top-----wow!!!! WOW! Lovin' that twine action! Awesome layout! Super lovin' those Shimelle cork stickers! My name is Ellie & I am Thickers addict..ahh that feels so much better to have it out in the open :) Your page..Hmm SHUT UP w/the AWESOME SAUCE! Love it!! Love your twine-filled heart!! A beautiful page!! I think I would have to go with Thickers as my fave product from AC! That layout us seriously cool. I love how bright and happy it is! My favorite product by American Crafts is the papers! Love your gorgeous page! I heart american crafts papers best! Love love love love this!!! LOVING what you did with that twine! Pinning!!!!! Wow!! Good way to use bakers twine. Your layouts are SO amazing! I'm always blown away by your cool new ideas for using these great products. My favorite product would have to be Thickers. I am also fawning over Shimelle's new line lately. What a cool effect you on your page! I love it! I think my favorite piece is the gold alphabet letters. ... swoon! Fabulous!! You are amazing with your designs! I just bought some of the DIY Shop stuff, so cute. Favorite product?...forced to choose I will say the cork embellishments. Another fabulous page, Paige! Thickers are my favorite - followed closely by all of their cardstock. It's the only paper I'll cut in my Cameo (after trying almost every brand). Love how the random twine lines! So youthful. My favourite product is probably patterned papers; no, wood veneer; no, stamps; no diecuts..... I love it all!!! Can never have enough thickers! I so ❤️❤️❤️❤️❤️this layout... You give me so many great ideas to put a dent into my hoarder stash... Now to only put that in action.😳 My favorite AC product is all the beautiful 12 x 12 paper.. There you have it I have confess my Scrapbooking sin.🙀 back to this beautiful layout I would love to see a start to finish video on this... Adding this to my favorite layouts. Thank you for a chance to win this amazing giveaway. Wow! What an incredible layout! Love the stickers and thickers! Wow! Your creations are so inspiring Paige! I would say my favorite AC product is Thickers. I have soooo many of them. Love the layout. All that twine gives such great dimension and looks so colorful as all your layouts always look. And my favorite AC product us the new shimelle line. The colors are great. You always now how to catch my eye with your layouts, they are always stunning!!!! My favorite craft product are papers of course, I can't stop buying them! How fun is this page? I love the heart and your fun use of twine. My favorite AC product? I have so many that it is hard to pick just one. I would have to say some of the fun overlays they are producing right now and THICKERS. I just love Thickers, followed by 6x6 paper packs! Thanks for the chance to win, love reading your blog. This layout is so amazing, Paige!! I love the rainbow colors around the edge of the heart, and such a great take on the string art look!! Thickers and Bits and Remarks rule! Love your amazing layout! I love the bright colors of your layouts. I can't scrap without black foam Thickers. I use a few fonts. I love that black usually matches the colors of my layouts. Your LO is an absolute stunner - what an amazing technique. My favourite AC product is any kind of Thickers, and narrowing that down even further, my alltime favourite font is Shoebox. a favorite collection when AC is one of my favorite companies?! I will have to say the dear lizzy lines always catch me! I have loved the wonderful colorful fun products that AC has put out for a long time. I love the dear lizzy collections and of course any thicker set is a must have. I still have to say the DIY shop items are my very favorite! Every detail was so awesome in that collection! Love the inspiration found here!! I love this string art heart! You rock the fun designs, Paige! I love AC thickers. Love what you've done with the twine. 12x12 card - so versatile and I love the season colours. What a cute layout!! My favourite AC product? Definitely thickers!! I love EVERYTHING by AC! AMAZING layout! I can always tell any page you make without checking for a name! You have such a wonderfully unique detailed style! I love it! Favourite AC. Well, its hard to not mention thickers! But after them probably #summer atm. My fab AC product ATM is all of the Shimelle collection. Thank you for such inspiring layouts! Such a gorgeous layout Paige! You really are my most favourite scrapper!! This is such a cool layout! Love how you used the twine. Favorite AC product...that's really hard! I guess it would have to be the papers (is that cheating?) and my favorite collection these days is Shimelle's. LOVE your "LOVE" layout Paige!!! The heart with the brads & twine looks STUNNING!!! THANK YOU for sharing your CREATIVE INSPIRATION and tutorial too - I look forward to trying it soon!!! My favorite AC product is THICKERS, LOVE my Thickers, especially DIY Thickers because I get to use AWESOME alphas then add WOW glitter to make the perfect shade of SPARKLE - THANK YOU for the chance to win some CRAFTY AWESOMENESS!!! Phenomenal layout Paige. I have to agree with Tracy. MY favorite AC product is Thickers. I have bunches. 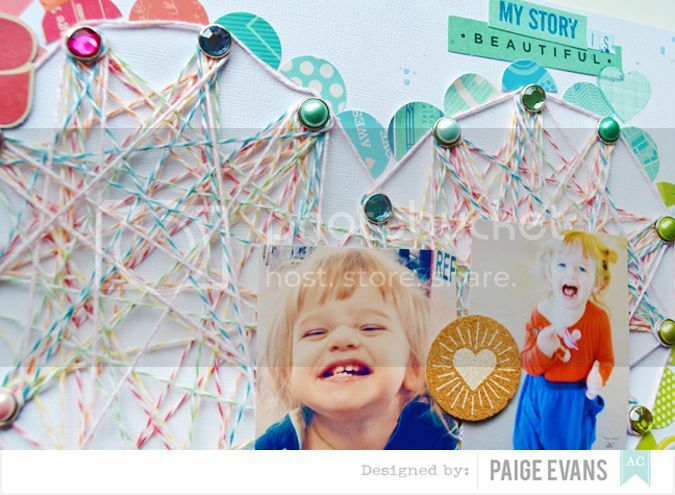 What a beautiful layout, Paige! You always manage to come up with such creative designs! Super cute layout with the twine art. Great idea to incorporate that onto a layout. Adorable photo too. Cute layout- love the string art!! I'm not sure what my all-time fav is but Chap definitely sits up near the top. I love their patterned paper! I can't get enough of it. Lovely page. I love the twine work. My favorite item from AC is Amy Tan and Dear Lizzy items. Wow, your layout is amazing!! I really love the way you made the heart, thanks so much for the inspiration. I love the dies that come with the signature lines! This is super duper fabulous! Wow, love it! I love embellishments and the die cut packs are my favorites. I love the thickers too, but who doesn't? Love AC papers!!! Your page is amazing as usual. I'm yet another tried and true Thickers fan! I also love everything Amy Tangerine!!! This layout is so awesome and unique! I love your use of the twine (I myself struggle to find a way to use it). My favorite AC product right now are the project life base kits. I am a traditional scrapper but am loving finding ways to use the cards together on traditional 12X12 layouts since the cards are so color coordinated. Its much better than cutting up a large 12X12 PP to just get a splash of pattern into the page. I love the Kraft cards and envelopes! Absolutely adore your style, so much creativity and totally fun! Favorite AC product is the Dear Lizzy Neapolitan paper pad! And really everything else!! My fave has to be patterned paper. And/or Thickers. LOVE! I'm definitely a paper gal!! :) Love your page as well! Love all that color and pattern. Favorite product? Thickers - hands down! I love the ribbon that AC designs, Very versatile. Welcome to the design team. First, this page is gorgeous. All your layouts are so impressive. My favorite is thickers. I use them in a lot of layouts. Loving all the color and patterned paper to capture the cutiness of Sweet Baby Jane. I love the Thickers and all the little ephemera pieces. Thank you! I am really loving the new Shimelle line! What a fun layout! I use AC's thickers all the time - on almost every layout!! I am so impressed with the selection and variety of styles AC offers!! They are my favorite!! I simply adore your style! Always so colorful and different. My fave would product would be Thickers. Can't get enough! Paige your pages are truly amazing! And THICKERS are my favorite AC product, can't make a page without them!